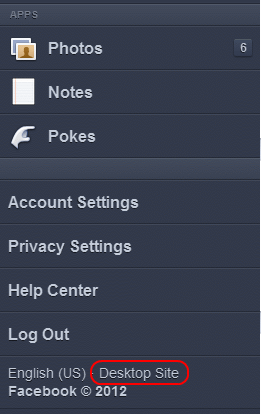 A lot of users have commented on an older post of ours detailing how to use the then-newly updated Facebook app for iPhone. To be specific, we’ve gotten about 40-50 comments (80 including our responses) asking for help with things like feature locations, how to delete posts, and a variety of other questions. However, the most frequently asked question, by far and away, dealt with posting content to Facebook pages in the iPhone app. If your posts on your page show up on your personal profile or vice versa, you’re in the right place. This post aims to detail a few quick ways to troubleshoot common problems with managing your Facebook page from the iPhone app, Android app, or Facebook’s mobile site. Unfortunately, when it comes to mobile Facebook hasn’t been as on the ball as they could be (hence the $1 billion dollar acquisition to play catch-up), and both their mobile site and mobile apps can be very buggy. Here are a few steps you can take try to fix any issues you might run into. Although a bit time consuming, this is also the easiest way to troubleshoot things. Log out of the Facebook app on your phone, uninstall it, reinstall it, then log-in. Test the problem you’re having – no dice? On to the next step. This requires help from a friend (or two Facebook accounts). What you’ll need to do is have the second account become an admin of your Facebook page. That person will then go to the page, select the ‘Manage’ tab in the admin panel, then click ‘Manage Admins’ on the right side of the page. Then, they simply remove you as an admin by clicking on the ‘X’ next to your name and photo. Log out of your account, then log back in and confirm you’re no longer an admin on your page, and then have the other person add you back in to the list of admins. Refresh your page and then test the problem you’re having. If neither of the other two solutions did the trick, you’ll have to try using the mobile site. Unfortunately, the mobile site is not as fully featured as the mobile apps can be, but it usually mirrors their available features pretty closely. To use the mobile site, simply navigate to facebook.com on your mobile browser – it will automatically redirect you to the mobile version of Facebook, which should look pretty familiar once you’ve logged in. Test your problem again, and if you’re still not having any luck, fear not – there’s an almost catch-all solution. If none of the other steps you’ve taken have done the trick, you’re going to need to use the desktop site on your mobile browser. To access the desktop version, all you need to do is go to facebook.com on your mobile browser, click the three horizontal bars to pop out the side panel, and scroll to the bottom of the menu. There, you’ll seek the words ‘Desktop Site’ at the very bottom, to the right of your language preferences. Select it and the site will reload as though you were on your home computer or laptop. On Android Phones, you’ll be able to upload photos, videos, and do anything else you normally could do from your desktop. However, iOS devices will have limited access to features like uploading photos. This means you’ll still be able to share links or status updates that might have previously posted to the incorrect profile, just no photos. It’s a cumbersome method, but it will guarantee your content gets uploaded properly and not inexplicably dumped onto your timeline. This is the most radical of the options available to you, but I’ve resorted to this method before to upload content when Facebook was being especially finicky. You’ll need to download a free remote viewer to both your mobile device and your computer – I suggest TeamViewer, as it’s free, excellently supported, and has clients for iOS, Android, Windows, Linux, and OSX. After you install the app, you’ll be able to remote access and control your computer. Access Facebook through there and you’ll definitely be able to get your content where it needs to be. Have an alternative solution, or a question? Let us know in the comments.